A WordPress cafe theme could cover lots of industries, but it mainly focuses on restaurants, cafes, bistros and any type of business that serves coffee or food. 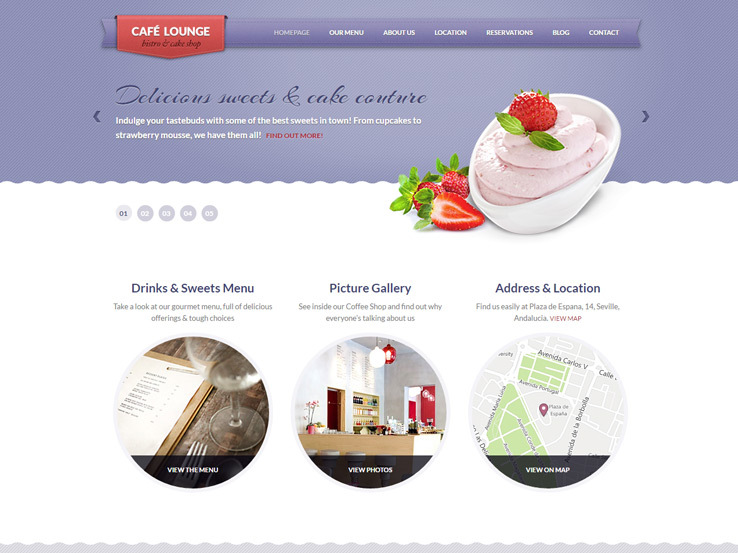 Therefore, you have several options to choose from when looking for a solid cafe theme. The problem with that is you’re going to have a tough time locating a solution that’s perfect for your brand while also being a decent website theme. After all, you may end up finding a WordPress theme with wonderful colors and settings, but it may not work well with third party plugins. Our goal is to ensure this doesn’t happen to you. So, we put together a solid list of WordPress cafe themes for you to cut down your shopping time. 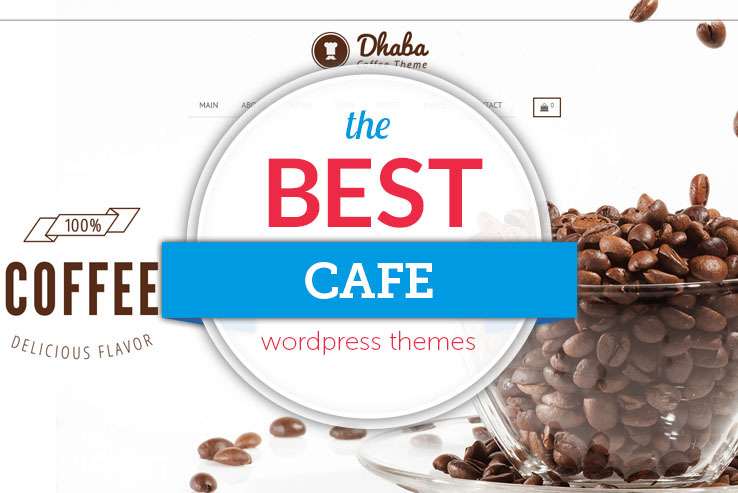 What’s Included In a Cafe WordPress Theme? What can you expect to get from the majority of these templates? To start, all of them are going to have responsive designs, meaning that users can go to your website and have no problem viewing content on mobile devices. In addition, all the themes below are premium options, with support from professional developers. You won’t have any problem getting in contact with the developers, and in general, the features are simple enough to understand by yourself. Another cool part about cafe themes are that they provide interesting tools for booking reservations and presenting menus. Obviously, not all cafes are going to need a reservation system, but a few of the themes have modules for accepting reservations and managing the people who are coming into your shop. The menu is probably going to be the most important part when choosing your cafe theme since you’ll want it displayed somewhere early on your website, so people can quickly see what you have to offer. Finally, we enjoy the themes that have support for high-resolution media. For example, you may want to include an image gallery, or even a video to welcome customers to your website. Since media slows down your site and is sometimes troubling to upload, it’s nice having a theme that makes media look nice and function properly. So, give the themes below a test, and maybe you’ll find one that’s ideal for your cafe. If you’re starting a coffee shop or cafe we hope this list of themes helps to guide your theme shopping process. 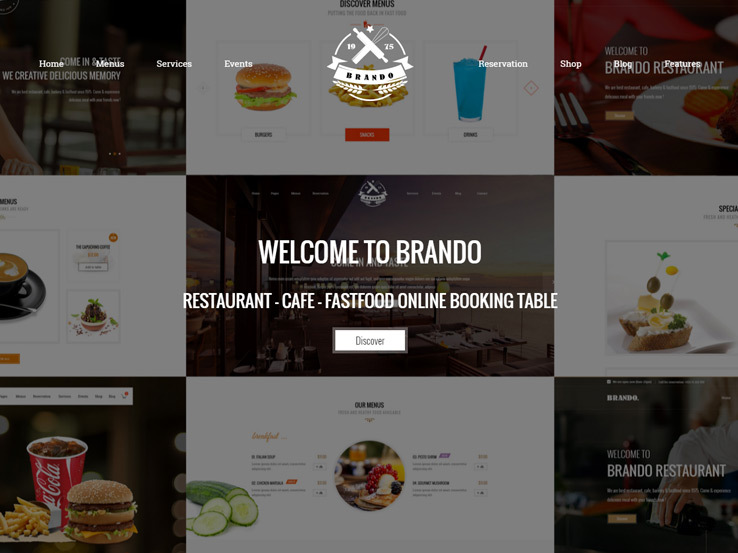 Consider the Brando WordPress theme if you’re interested in a very powerful menu builder for your website. The theme is completely responsive, but the primary feature is this menu builder, which comes with the theme as a plugin and allows you to quickly construct your unique menu within a matter of minutes. The menu builder supports all types of restaurants and cafes and it includes some handy visual tools such as a drag-and-drop builder. 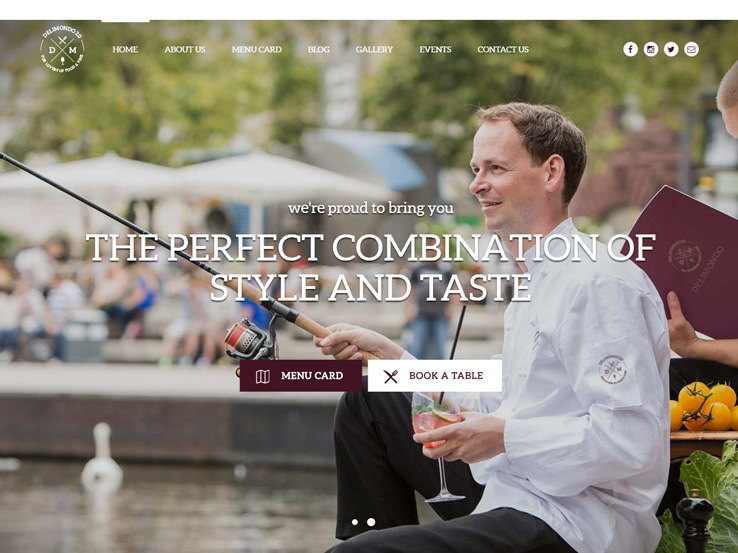 Four restaurant homepages come along with the Brando theme, making it easy to stand out from the competition right out of the box. Although four homepage layouts may not sound like that many to you, that’s only the tip of the iceberg in terms of customization. A few coffee homepages are included with the theme as well, catering to those businesses that are focused solely on the hot beverage. You’ll also find options for fast food restaurants, making this theme one of the more versatile on the market. The parallax background creates a smooth animation effect for your website, which is perfect for grabbing the attention. One area we really enjoy with the Brando theme is the online booking module. You’ll notice that not all of the themes on this list have support for online bookings, so restaurants with reservations should take a hard look at this one. The online reservation is completely customizable and it looks clean on the front end so your customers can easily make reservations. The product quick view feature has a lightbox setting for revealing pictures of your meals and beverages. Feel free to include details for your menu items and even throw some nutritional facts in there. Social media sharing buttons are scattered all over the theme and you can choose between wide and boxed width layouts. The Visual Composer extends the drag-and-drop functionality, while tons of Google Fonts are great for adjusting your typography. Make your own video background and utilize the Revolution Slider for promotions, images, and news. Along with multiple colors and a blog, the Brando is by far our top choice for cafes. 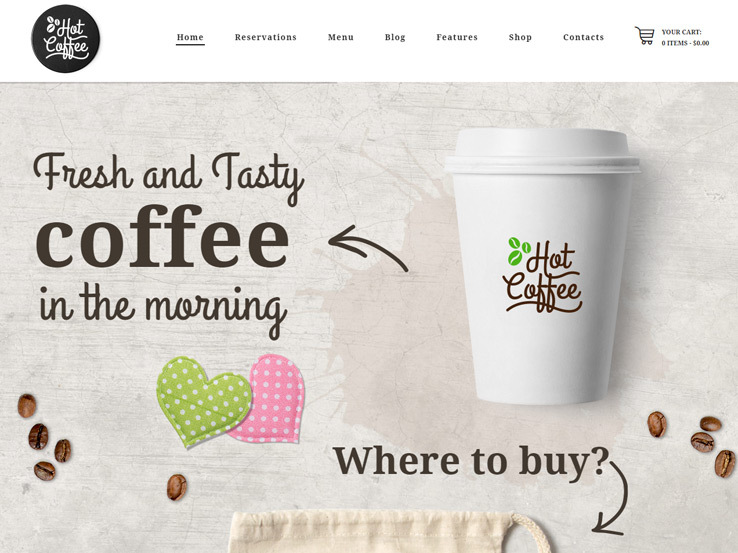 The Hot Coffee WordPress theme has a clean, unique design and it’s clearly made for a coffee house. The playful imagery and icons are useful for letting people know that you’re running a small, yet vibrant business. The installation is super easy and updates are released on a consistent basis. The FoodPress plugin works great with the theme, meaning you can setup menus and reservations, all without spending any time on the development. So, you’ve got support for both menus and reservations, but what else can you expect from the Hot Coffee WordPress theme? Well, it’s ready to work with WooCommerce, which means you can easily monetize the website. Feel free to sell some of your house coffee online or consider making your own coffee house t-shirts for your most committed fans. The events calendar comes into play for local companies that would like to let customers know when they can stop by for a special event. In addition, the theme includes the Visual Composer plugin. This means that you’ll get a drag-and-drop interface, keeping your hands free of the source code. The cool, vintage design offers boxed and wide layouts and the Revolution Slider plugin allows for animations and overlaying text and buttons. The navigation bar is easy to customize and it comes with a CSS module for making your own changes. The media content manager is ideal for cafes that are going to upload a decent number of images to the website. The shortcode generator is yet another way to completely forget about touching the source code. Overall, both beginners and advanced users will find this theme suitable. It’s powerful enough with access to lots of custom coding, but it also includes great tools for launching a cafe site within a few minutes. It’s also worth mentioning that several custom widgets are included with the theme. For example, you’ll gain access to widgets for Facebook, Twitter, recent posts, top 10, social icons, skills, and more. The Cafe Art WordPress theme has an elegant layout, with light and dark layouts. This immediately allows you to differentiate your company from the competition, but you can also modify colors, homepages, and the width of your website. Free fonts, icons, and patterns are available when you purchase the Cafe Art theme and the responsive layout ensures that anyone can see your content, whether they’re using a tablet, phone or computer. An email subscription module comes with the theme and many webmasters really enjoy the parallax slider. This slider has overlaying text and contact information and it still looks great when a customer brings it up on their smaller device. The logo sits in the middle of the header and you’ll notice quite a few menu options to the left and right. The blog is perfect for boosting your SEO and sharing valuable free content with your audience. A table reservation can be made directly from the homepage. In fact, it’s generally one of the first items that people see on your website. The menu looks similar to a portfolio, with a grid-based layout and beautiful thumbnail images. Pricing resides right next to the menu items and people can click through to view more information about each one. The best part about the menu is that the filters let people choose just one type of menu or category, cutting down on the search time. Post testimonials from past customers and even upload an image of the person who gave you the testimonial. Your blog is featured on the homepage and each of these posts supports videos, images, and galleries. The theme also comes with several social media buttons. This is a huge benefit for cafes that don’t want to go out to find another third-party plugin to get simple buttons. Finally, the very bottom of the homepage displays a contact form. Feel free to customize this however you want and utilize the embedded map to guide people directly to your store. Your phone number is displayed in huge letters and there is also a completely different contact page for those who don’t want to scroll to the bottom of the homepage. 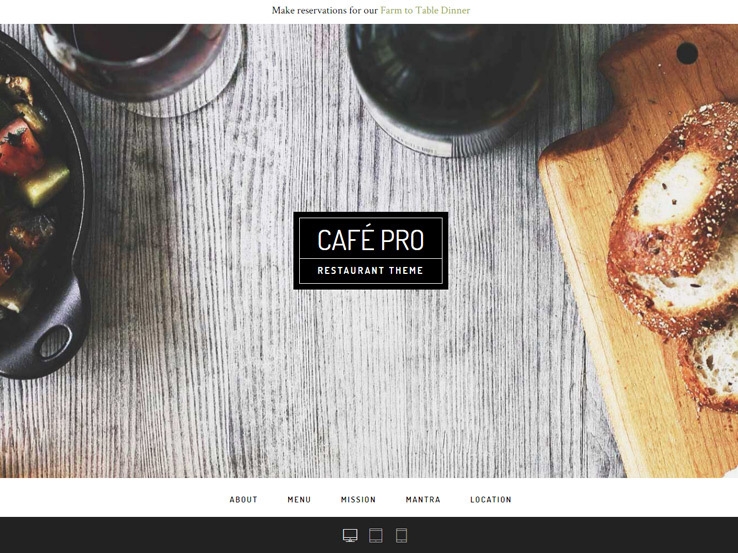 Overall, the Cafe Art WordPress theme is an impressive theme, but it keeps things simple for the smaller cafes that are only looking to get the word out to local customers and search engines. As we discussed above, media support is one of the best things you can ask for in a cafe theme, but the booking module will also make your day-to-day so much easier. The rich browns of the Sweet Life demo make it an ideal choice for bakeries and cafes, although you can change the colors to match your brand. The crinkled edge of the header, reminiscent of cupcake papers, is also a cute touch. The Home 1 option, with its slideshow of delicious looking delicacies, is especially inviting and will urge visitors to keep going. Add recipes to your page to let customers in on a few of your secrets but also pack your blog and portfolio with scrumptious photographs to remind them that they’ll never be able to replicate your artistry. Once their mouths are watering, customers can place online orders with a WooCommerce powered shop, which includes reviews from satisfied buyers to help them choose. Sweet Life runs on the Jetpack plugin for the highest in website performance, only available with WordPress and the Skeleton grid base will also ensure that your site looks great on all devices for orders on the go. 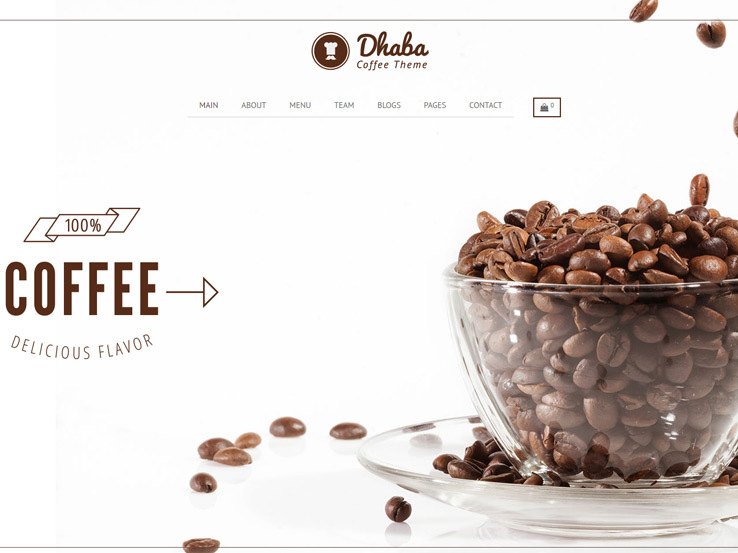 The Dhaba theme was specifically designed for food service businesses and comes with tons of fantastic features to put you a cut above the rest. 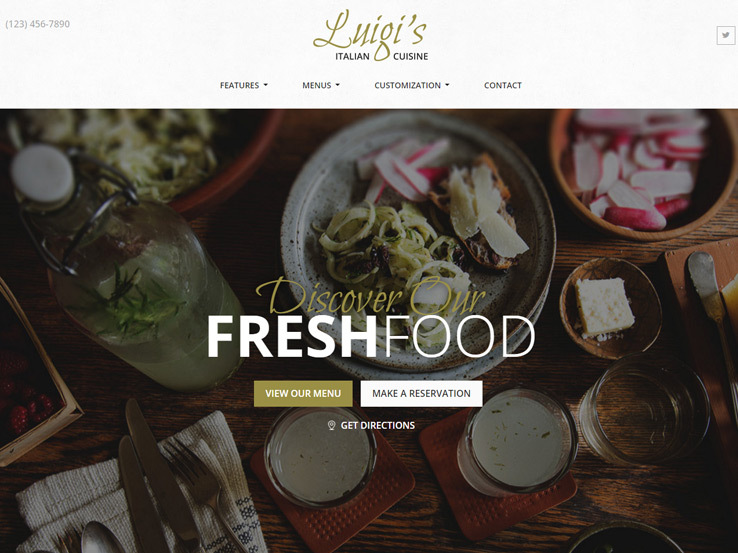 This theme comes with three distinct homepage styles for restaurants, bakeries, and coffee shops. The restaurant theme opens with a full screen slideshow header that signals the full service experience that awaits them at your eatery. 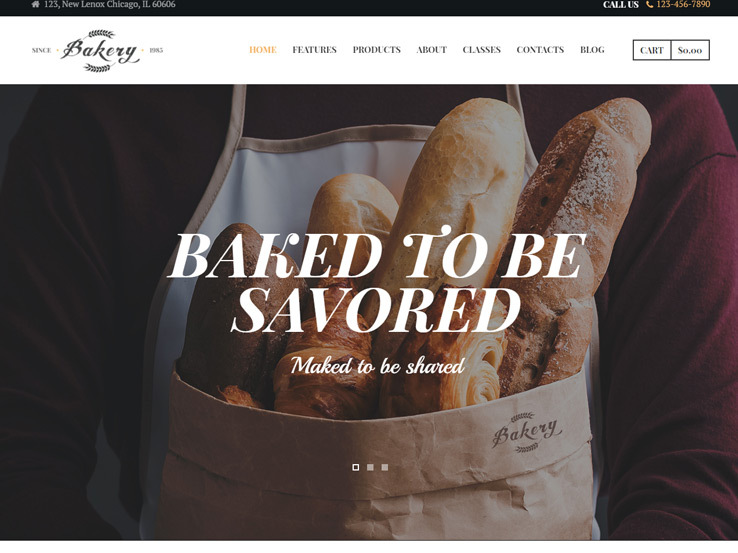 The bakery and coffee shop main pages include ample white space for a lighter, more whimsical feel. You can further fit your website to your business with unlimited color choices and Google fonts. Busy customers will appreciate the convenience of online table booking and shopping to order ahead. Choose between two classic looking menu/shop styles with helpful options like a sidebar for product categories and filtering by price as well as Top Rated items for the indecisive. Patrons will feel more like a part of the family by getting to know your talented chefs with one of two Team pages including photo hover effects to connect to personal social media accounts. A Flickr feed, available either as a sidebar or in the footer, is a wonderful final touch for showing off special items and events. Customers will never want to say, “So long, farewell,” with the Liesel theme for cafes and bakeries. The unique Flipcard plugin comes with a flashy flipping animation for an impressive viewing experience. Each card is customizable and is a great way to show off your menu and products, share recipes, or whatever your imagination can devise. With the Fancy Header feature you can create a different header for every page or post, including parallax and video options, for even more flair. You can also choose a custom background to compliment the header and display your delicious wares. Turn your business into a community with an Events Calendar and a newsletter through MailChimp to keep patrons involved. They can also get to know your team with individual bios that include the skills that each brings to the table. The blog is a fantastic way to share tips and special projects and with the sidebar and footer, recent posts and archives are always within easy reach. And make paying you a visit easy with online reservations and a shop that includes a Wish List for limited items. 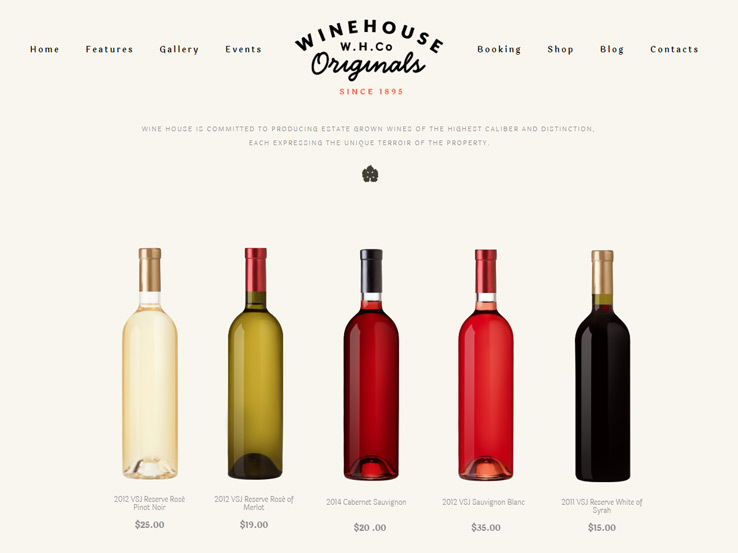 Wine House is an incredible choice for the modern vintner, whether you’re running a shop, restaurant, winery, or publication. This theme comes with six sleek homepage layouts, tailored to your business’s needs. Spotlight featured products or give a broad overview of your operation with a grid for photos, videos, and information. Patrons will be eager to know the artists behind their favorite vintages in an Our Team section and keep up to date on every party and tasting with an Upcoming Events block. Parallax section headers will keep it all organized while also adding a bit of panache. Gorgeous photos, on the homepage or one of several gallery options, set off the dazzling hues of your stock and introduce customers to the labor of love that is winemaking. Shopping is made easy with product descriptions including bar charts for such qualities as sweetness, acidity, and bouquet as well as reviews from the unbiased public. A convenient booking system is available through the WP Booking Calendar plugin and can be done by either date or table. And social media integration, including Behance, will keep you connected to clients across the web. 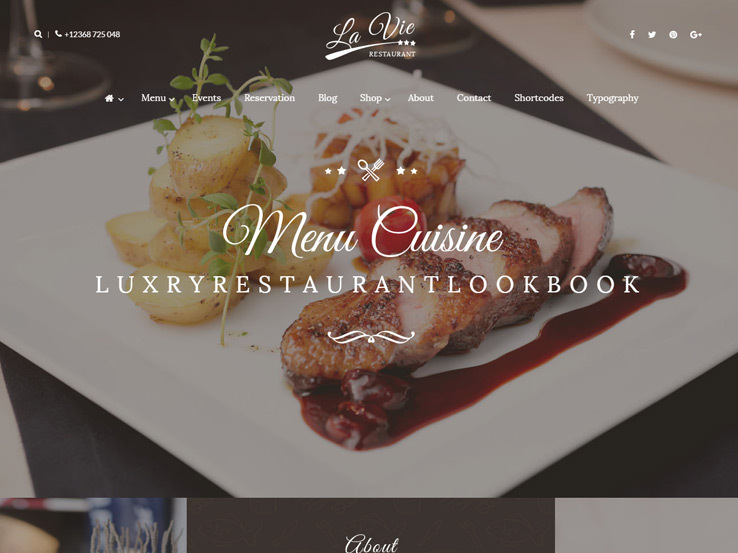 Your site will be the life of the web indeed with the La Vie theme. An events page with individual postings that look like invitations cards will make your customers feel like they’ve been asked to an exclusive celebration. Optional zoom effects on pictures give an impression of intimacy and enticement. Irresistible photos of menu items, on the top slideshow, as background images, or in a gallery or blog posting, will leave visitors unable to look away. Complement these with unlimited colors and FontAwesome icons for a dazzling visual experience. Once guest are drawn in, the UberMenu plugin and WooCommerce integration will make it easy for them to satisfy their cravings. The shop has a convenient sidebar for Product Categories, Top Rated Items, and Your Cart to keep track of what you’ve chosen. The Google Maps feature will get customers to you quickly, for pickups or luxurious in house dining. Setting all of these amazing options up will be easy too with Visual Composer and its Extensions. Variety is the spice of life and that’s exactly what you’ll get with the Grand Restaurant theme – variety to match the rich flavors of your food. With six homepage options, you can choose from the simple to the stylish. Particularly enticing is the ‘New’ layout, with a full page header photo, menu photo grid, menu category boxes, and beautiful parallax effects. An additional six menu options gives you lots of flexibility create the design you want, all of them with a clean and uncluttered look. You can also add sliding animation effects to your photos and customize your site with unlimited colors and more than 500 Google fonts to perfectly fit your brand. The live content builder for this theme is similar to the program Keynote, making it very intuitive and easy to use. Choose from between Live or Classic design mode depending on your comfort level with the program. Grand Restaurant works great with WooCommerce for online sales and MailChimp for newsletters. Taking reservations is also a snap with the ability to accept bookings via an email form, custom URL, or OpenTable. Google Maps integration makes you easy to find and you can change the color scheme with Snazzy Maps. Optimization for Google Mobile Compatibility Check ensures that your site will be prioritized in searches and work flawlessly on mobile devices. Your customers will feel like guests of Ernest Hemingway with Café Pro’s clean lines and uncluttered layout. Each section, from the introduction to the menu, looks like a typewritten missive from Papa himself. There’s no need to look for symbolism though; social media links are spelled out in the footer so there’s no confusion. A reservation form from Ninja forms, included with your purchase, will help those guest find their way to your table without delay. 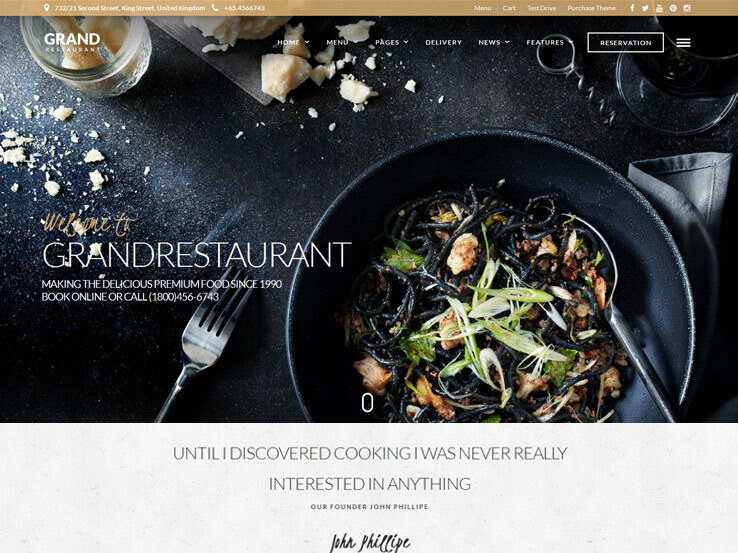 This theme combines two of StudioPress’s most popular themes – Parallax and Foodie – to create the perfect design for a small café or bistro. Built on the Genesis Framework, your site will be the best in quality but the Theme Customizer, Custom Templates, and detailed tutorials ensure that getting there won’t be a hassle. Café Pro is a higher end theme, price wise, but it comes with unlimited updates and support and you’ll never have to pay another fee. The Delimondo theme comes in five different ‘flavors’ to complement the cuisine you serve. There’s the sweetness of Cupcake, the indulgence of Pizza, the juiciness of Steak, the savory taste of Seafood and the original Delimondo. Turn your website into a feast for the eyes with five homepage styles – slider, Ken Burns, parallax, video, or static image. Ken Burns, in particular, is an amazing way to draw customers in. Add unlimited color choices, more than 400 Font Awesome icons, and incredible typography options to make your site a reflection of who you are. This theme comes with a custom menu card and events post as well as a clean looking calendar setup to keep your social schedule running smoothly. 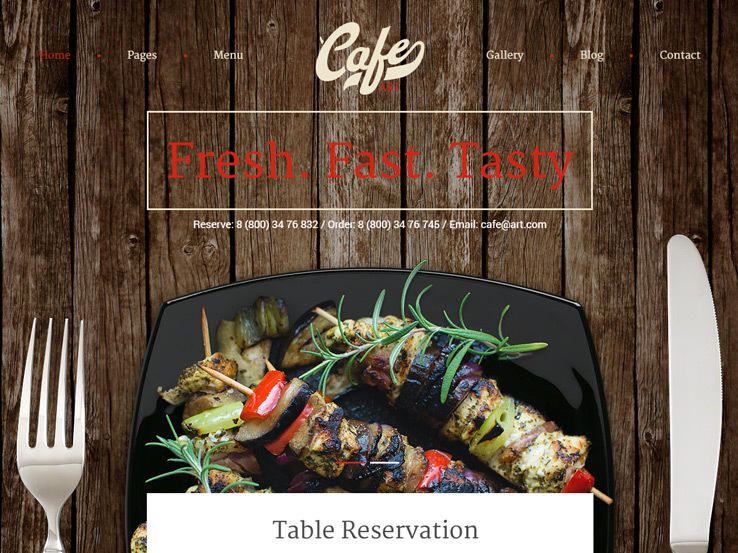 Guest can also book their table in a neat footer block. Stay available to your customers with social media icons in the header and contact forms from Contact Form 7. And easily maintain all of it with the one click installation, drag and drop page builder, and five-star support. 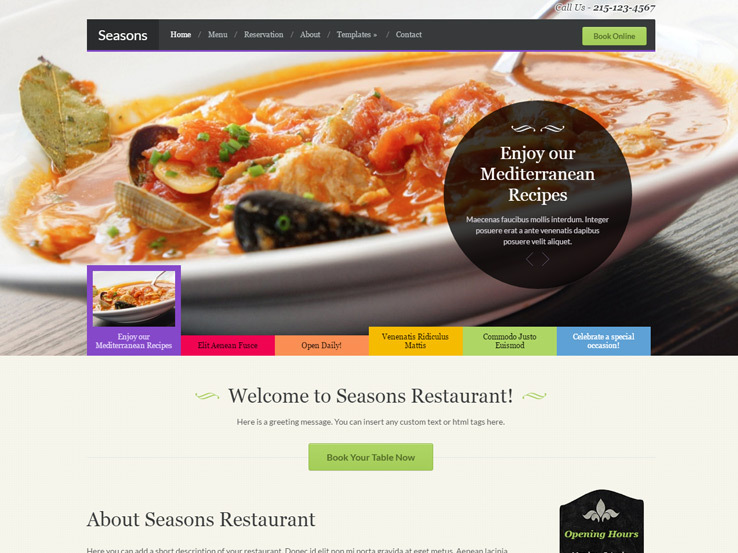 From WPZoom comes Seasons, a stylish WordPress theme for cafes, restaurants, hotels, and other food related businesses. The theme has a beautiful slider that you can use to feature photos of your best dishes on the homepage, a reservation form for people to book tables directly from your website, and a menus module to show potential customers what you have to offer. The top section has a spot to display your phone number so people can quickly get in touch, and you can also add a contact form within minutes. In terms of customization, you’ll find an intuitive theme options panel from where you can style almost every element of the theme to suit your requirements. Upload your own logo, change fonts and colors to match your brand, and customize the header as well. Fable is another clean and modern design in our collection. It comes with 4 demo layouts targeting cafes, restaurants, pubs and bakeries. The header area supports fullwidth banners, which are great for welcoming people to your page and leading them to your important sections. 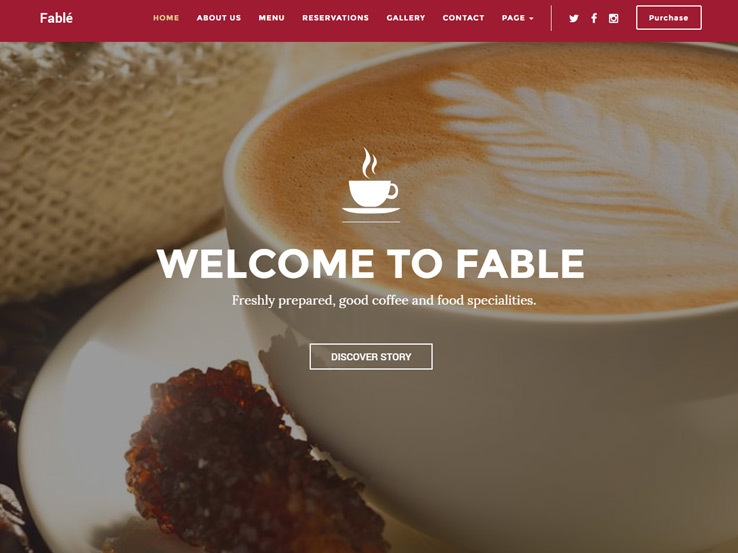 A beautiful menu module comes with the Fable theme, allowing you to show potential customers what delicacies await them. The menu page displays your menu items along with their thumbnails, descriptions, and pricing. People will have no problem booking tables from your website since the template comes with an in-built online reservation system. You’ll also find a beautiful gallery section that displays your photos in grid format, social media integration, and a blog to share your expertise and boost your search engine rankings. Besides, the Fable theme includes the Visual Composer plugin for building custom page layouts with ease, shortcodes, and unlimited colors and typography for branding. The Cafe Cultura theme has a clean and elegant design and all the features you’d need to create a strong online presence for your cafe business. It makes it possible for you to take reservations right from your website, promote your upcoming events, create menus to show people what you offer, and display customer reviews and testimonials for the ultimate social proof. The frontpage has an attractive fullscreen banner area to welcome visitors to your site. The banner has overlaying buttons to lead people to your menu and reservation pages. The blog is great for sharing updates with those interested in your cafe and you can also display your opening hours so people can know the appropriate time to visit. Along with Google maps, photo galleries, contact forms, and lots of customization options, the Cafe Cultura theme is a solid choice to go with. 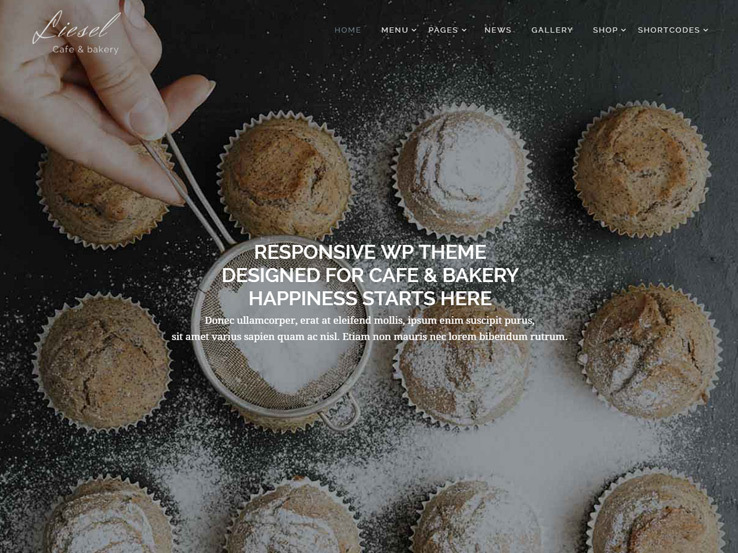 Consider the Bakery theme if you’re looking for a modern, flexible, and highly customizable solution for your cafe or restaurant website. The responsive theme integrates nicely with the WooCommerce plugin, allowing you to set up an online shop for your cafe within minutes. You’ll also find a powerful media content manager to handle your photos and videos, all while maintaining high performance. Lots of customization options are included with the Bakery theme. You can customize the layouts, colors, and fonts to achieve a unique design for your website. In addition, you’ll find lots of custom shortcodes and widgets that will speed up the development process. There’s also social media integration, Google maps support, and a blog to boost your website traffic. 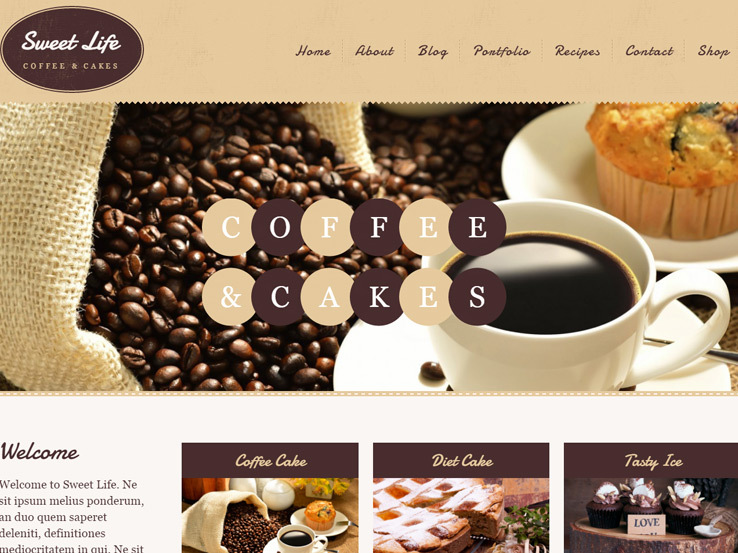 The Coffee Lounge theme comes from the folks at Themefuse. It has a unique design with a stylish header, beautiful sliders to highlight your promotions and important information, a gallery to showcase your photos and entice people, as well as the ability to accept reservations from your site. The menu displays your items in list style, with thumbnails and pricing details. You can also display your location using Google maps, collect email addresses from potential customers so you can send them your promotions and newsletters, and share your knowledge using the blog and generate more traffic to your website. 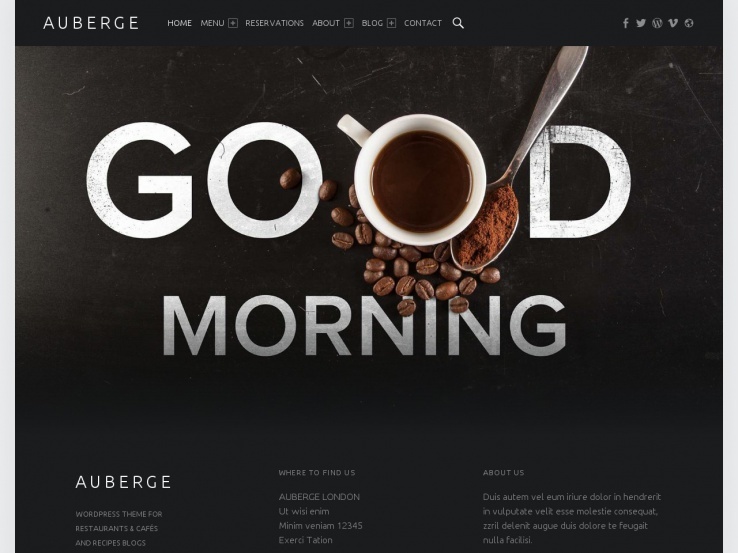 The Auberge theme brings a simple, modern, and responsive design along with an impressive set of features. It includes custom menu posts and integrates nicely with Schema.org so your recipes will look attractive and invite more clicks in search engine results. The reservation module allows potential customers to book tables straight from your website and you can also create a gallery to show off photos of your cafe or restaurant. We like the blog as it includes special recipe post types besides the standard post formats – audio, video, image, gallery posts, and more. Use the blog to share your knowledge and attract traffic from search engines and social media. You’ll also find translation tools if you’d like to display your website in different languages and a user-friendly customizer for styling the theme. 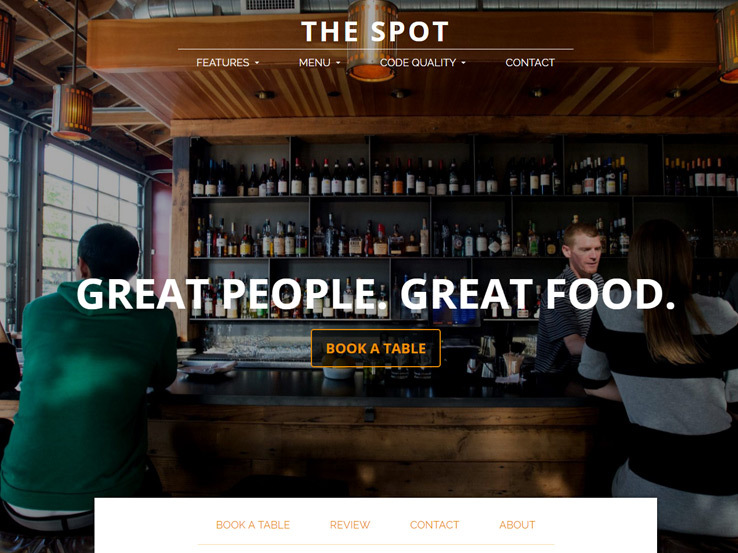 Meet the Spot, a classy WordPress theme for restaurants, cafes, and other hospitality businesses. The template makes it easy to manage reservations from your website, create and promote events, and create menus that you can easily display anywhere on your site. The reviews and testimonials module allows you to feature customer feedback on your site and boost sales, while Mailchimp integration makes it possible to build email lists and supercharge your marketing. Furthermore, you can easily customize this template even without touching code. Simply upload your logo and change the background, colors and fonts to match your brand. Your purchase also grants you access to top-notch support from the developers and ongoing theme updates to help ensure your website remains secure and compatible with the latest version of WordPress and its plugins. Brenda Barron is a writer from southern California. She specializes in WordPress but she’s really not all business. In fact, she spends her free time outside with her family or on the couch knitting.